SEO may seem like a mystery for some but the honest truth is that when you’re starting off and don’t have much of an audience, SEO matters. At the beginning you won’t be able to rely on a steady flow of loyal readers. If your blog is anything like mine, at least 60% of your traffic will all come from Google. That wasn’t by some sort of fluke but putting some stuff in place to make sure you can rock at optimizing for search engines. Search Engine Optimization (SEO) is all about ranking high in searches for keywords that you want to focus on with your website. If people are finding your website through Google or another search engine and click on it, then you’re doing something right. At this point I might as well only talk about Google because the gap between Google and the other search engines is so enormous. Google accounts for roughly 67% of search traffic in the US. Focus is key and so my recommendation is to just focus on Google. So how does search engines like Google figure out if a site is worth ranking high in searches? When you boil down, it’s all about links – both links pointing to your site and links within your blog that point to other pages and posts on your blog. The concept is this, the more other pages link back to you with specific keywords, the more authoritative you must be and that kind of makes sense right? New York Times is going to do very well because people are always linking back to them in other articles and posts. If your blog can get to that level, you’re guaranteed to do pretty well. Your goal: Get your pages ranked on the first page. That’s when you’re going to start seeing a lot of traffic from Google. And personally for me, it’s really when my blog post on “Top 10 Things To Do in Shanghai” soar to the top that I started to see a huge growth in traffic. Why this is important early on: From the moment you decide to create your blog, you need to think about SEO. It is extremely difficult to go back through all your posts and pages to refactor in SEO elements. Do it right from the start. I must’ve done something right to get up there. And you’re probably wondering what that is. That’s why I break it down to 7 steps to get yourself moving in the right direction – trending up. There are so many little factors that all come into play for SEO. Some are bigger than others but when you put them together, you start becoming a bigger influencer in Google search. I’ll be honest, when I first set up my WordPress site, I just stuck with the defaults and for the longest time my links looked like “http://goingawesomeplaces.com/2014/08/helloworld”. I still see a lot of blogs set up like this. Are you one of them? The date is unnecessary and unfriendly to remember. Since you ideally want your blog posts to live on forever, why attach a date to them? Luckily, in WordPress this is an easy change. Just go to Settings -> Permalinks and change it to “Post only”. Under Settings, change your permalink settings to “Post name”. There’s no reason not to do this. With this in mind, another thing that is easy to miss is that the words in the URL make a difference. Keywording is going to come up time and time again and with the URL, you want to make sure that you make adjustments to it if your blog title doesn’t quite hone in on terms that you want your post to target. Notice how the URL is different from my post title “GIVEAWAY: Free Retro Coca-Cola Mini Fridge AND 5000 IHG Rewards Club Points”. As a noob, I would often let WordPress just decide my URL but then I realized that I needed to be smarter about it. Not going to go into too much detail because I talked about my 10 favorite WordPress plugins but if you haven’t done it yet, you have to get something like All in One SEO which are dedicated plugins to manage SEO on your blog. Just having the plugin installed isn’t enough. In reality, these plugins just give reminders to fill in SEO details that get pushed out to Google when you publish. So if you don’t fill in anything, it would be as if you didn’t install it in the first place. There are two areas that are important and require attention. Site level details – How your home page shows up on Google is important. What title and description should show up when someone searches for “Going Awesome Places”? Using the right keywords here are going to make an impact on where you show up. So if your niche is luxury travel, make sure the word luxury is in the description. My recommendation is to search around for what your competing bloggers are doing to get ideas. Make sure you fill out the details in the All-In-One SEO settings page. Pay particular attention to your home page’s title and description. This may look different if you use a different SEO plugin. Post/page level details – Every time you write a post and page, if you scroll to the bottom you’ll see a bunch of unfilled boxes for SEO. If you don’t fill these out, Google’s going to just grab whatever text it can to fill out the title and description. The first 160 characters of the post sometimes doesn’t quite summarize what the post is about so this is your chance to tell Google exactly what it should put in the search results. 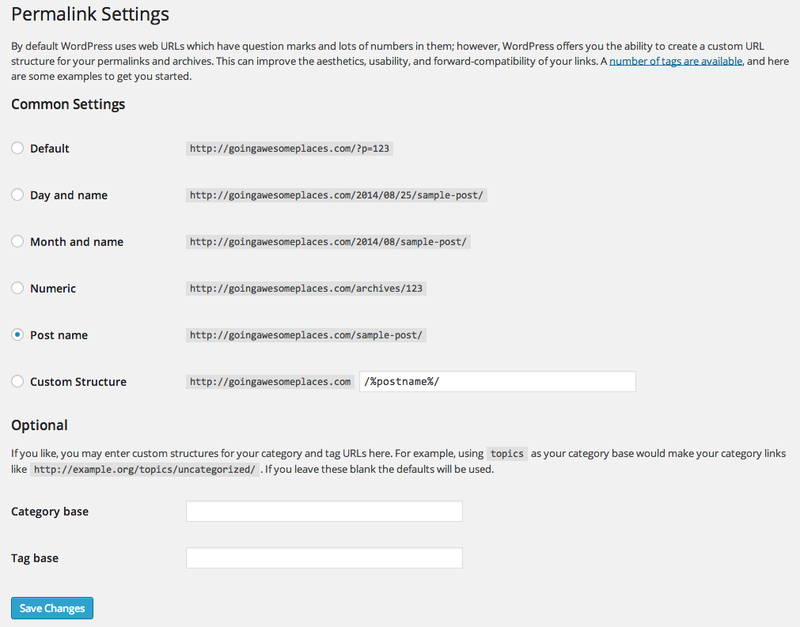 The post-level settings for your SEO plugin. There is a bunch of customization you can do with the plugin but I’ve left most of it to the defaults. Crawlers sound creepy and something that could give you goosebumps but they’re actually quite awesome if you want to do well in Google searches. By having a sitemap, this gives Google and other search engines a map of all the different pages that are available on your blog. Without it, crawlers need to do a considerably amount of work to traverse through the site. Whatever you can do to make it easier to get discovered by Google is key. The next step is to go to Google Webmaster Tools and submit your sitemap. And of course if you haven’t signed up for Google Webmaster, do that first. Once logged in, go to Crawl on the left sidebar and then click on “Sitemaps”. From there you get this page. Look to the top right corner and click on “Add/Test Sitemap” and type in sitemap.xml. Click “Submit Sitemap”. It’s hard to measure how much something like this affects search rankings but building social presence is now counting for a lot more than it did before. The more places your blog and posts show up, the more authoritative you become in the eyes of Google. A network that is worth paying attention to is Google+. I know a lot of you, including myself, haven’t focused too much time on it, but the truth of the matter is that this is a Google product. You want to do well on Google searches. Doesn’t it make sense to play nice in their sandbox? I’ve increasingly started to see my Google+ posts show up in search results. I know there’s some network affect there since my personal account follows my blog but imagine if your Google+ page had tens of thousands of followers? Domain name keywords – You might not be able to change this but if you’er starting off fresh, consider putting your blog’s niche into the name. I can’t really go back and change mine but imagine if I got a url like affordableluxury.com then I’d do crazy well in Google searches under “affordable luxury”. Home page title and description – Leverage your SEO plugin to ensure you drop in the right words. If your blog is about luxury, work with words that are associated to luxury. 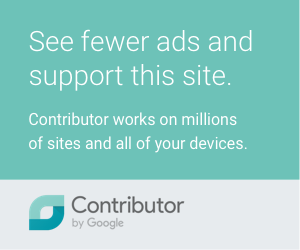 Two great tools for this are Google AdWords Keyword Planner and Google Trends. Use this tool to figure out what other words are popular and being searched for. Post title and description – Just like the above, your post needs to have a strategically crafted title and description. 1) to catch the attention of someone skimming through search results and 2) so that your blog post shows up in the first place because it contains keywords that people are searching for. Content keywords – Put keywords into the content itself and variations of it but don’t go overboard with it. Ultimately you want to be natural with your writing or else it’s going to seem really weird for your reader. I leave the best for last. In the intro to SEO, I talked about how Google rankings really rely on links to determine what site is more authoritative and thus worthy to be ranked higher than others. So what is all this linking business about? This can be broken down into internal and external. You want to interlink as much as possible on your site. When you’re putting together a blog post, I almost always have at least one link within the post that references another old post I wrote about that is relevant. If you haven’t noticed yet, I’ve already done that in this post. 1) You get your readers interested in other relevant topics you’ve written about. More time on your page is a good thing. 2) Not obvious at first but this is actually looked well upon by Google. For one it makes it easier for crawlers to find new pages. It also helps build link references to other posts which can help with ranking. And lastly, if you end up pointing to one particular page over and over, it basically lets Google know that this page is probably pretty damn important. Also called backlinks. This is truly one of the biggest things that boosted my visibility and rank. The key to it all is that you want to get keyworded links to your site. Despite everything I’ve talked about so far, this is perhaps the biggest game changer to how well your blog does in SEO. Links links links. It’s all about building links of quality (highly authority sites) and quantity (anyone and anywhere). Let’s talk again about why external links are important. This probably makes more sense with some illustrations. Let’s say there’s your blog and some competing blog. If you can get external links from authoritative travel blog sites like The Planet D and Mapping Megan who are relevant to your space, you’re clearly going to come out on top. 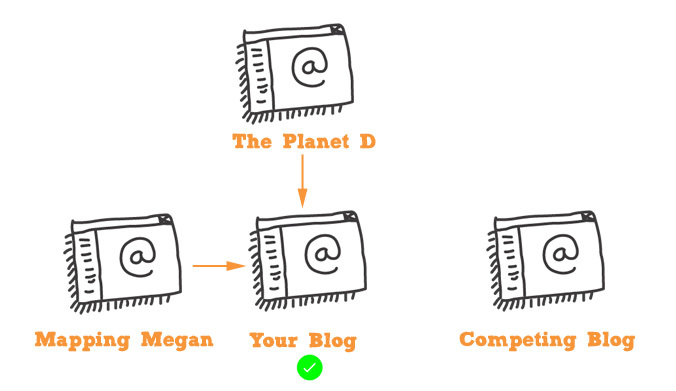 Google will think “Wow your blog must be pretty good if The Planet D and Mapping Megan are referencing you”. Now what if you ended up working a lot of building links to your site but from random areas that are outside of travel. You could have a ton of links but if the competing blog can get a link back from somewhere like New York Times, guess who’s going to win out. The other blog of course. So the lesson here is that quantity and quality of links matter. You want to build a lot but it matters where these links come from. Your effort should be focused on building links from authoritative sites in your domain (i.e. travel). As an early blogger, I didn’t really quite get the importance of anchor text. I would link back to myself like this http://goingawesomeplaces.com/ which in retrospect was extremely dumb. Anchor texts are what get displayed when you link to something. 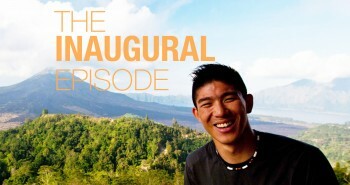 It’s this part of the link code: <a href=”http://myblog.com>anchor text here</a>. And it’s in the anchor text where keywords come into play. What you want happen is for people to link to your site using keywords that you’re interested in. The more your site gets keyworded in the anchor text, the higher up you’ll move in Google’s rankings. Personally I’ve found this part to be a bit hard to control when we talk about external links but when you do your internal links, never use anchor text like “here” or “read more”. Always use keywords that describe the post in your anchor text. How can you get links? Well that’s the question of the day isn’t it? There are a ton of ways to do it but for me the most legitimate way of building links is getting to know other bloggers in your community and work on cross posts, guest posts and interviews. Another way to do it is to do a straight up blog link exchange (a.k.a. blogroll) where bloggers will have a dedicated page to list links to their “favorite” bloggers. Lately some people have questioned the advantage of doing this as Google has gotten pretty sophisticated in terms of weeding out pages like these. Other ways of building links is to participate in travel forums. It’s hard to say how much it boosts my blog but I definitely notice backlinks created from forums where I’ve responded to people’s questions and linked back to my page. This process is very time consuming though so even I’ve stopped doing this in favor of focusing on other things. Examples of good forums are LonelyPlanet Thorntree and Fodor’s forum. There seem to be a bunch of sites that allow you to find other people outside your network to trade links but I personally haven’t used any so I can’t speak to it. If you find any good ones, I would love to know your experience. SEO is kind of a big deal. 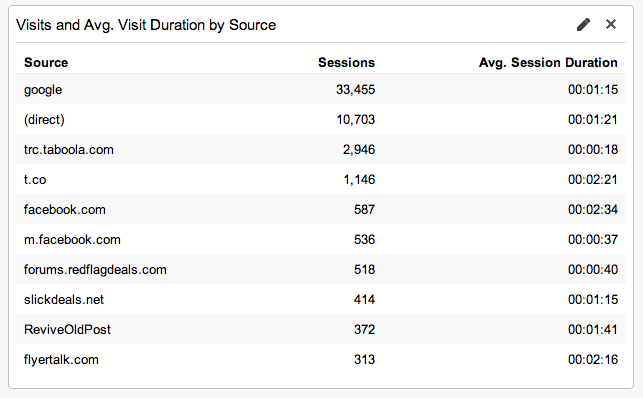 I’ve taken a screenshot of what my Google Analytics is showing me for the past 3 months. Google is always at the top. If you want to get traffic from search engines, you need to play nice with their platform and that means to optimize your site for them. Traffic sources from the past 3 months. Get these basics in place and you’ll also start noticing an increase in organic traffic (from search engines). Create content for what others are looking and searching for. Content ultimately still is king despite all the linking and optimizing you do. My blog started off as a diary of things but I realized that nobody’s searching for that information. People want to know “what to do in Shanghai” and “5 days in Bali” and so I started focusing on building “search intent driven content” and it’s helped a lot. This has been incredibly informative, man. Found you in one of the Facebook travel bloggers groups. I’m still in the process of learning SEO, and you’ve given some great pointers here. Bookmarking this site! Thanks for dropping by Tom! Glad you enjoyed the article! 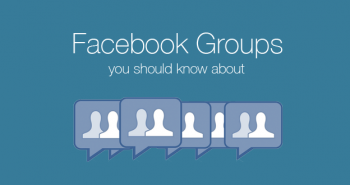 I’ve recently come across your website and Facebook page and both are incredibly useful! I’m struggling to grow my blog so thanks for the tips – I’m going to implement them and hope it helps! Petra recently posted…36 Hours in New York City on the cheap! Thanks for your kind words Petra! 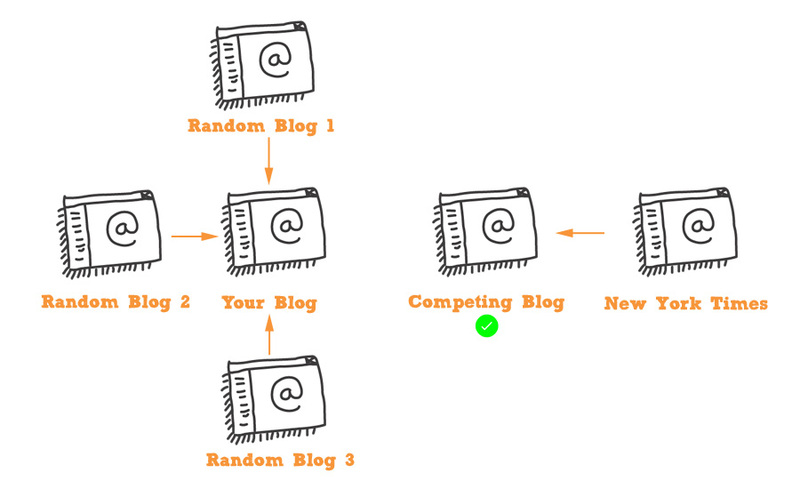 Hopefully these’ll make a big difference to your blog. If you have any questions do let me know! Great tips. I continue to be surprised at how many people forget to include a sitemap. Yeah totally. I guess a lot of people don’t know about it since it’s not quite built into WordPress (not sure why not) and so it takes that extra step to figure it out. 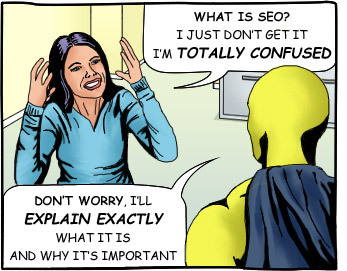 Wow, so much SEO information that I didn’t know about. Thanks for putting this together. I’m going to try some of these out now. Hey Will! Thanks a lot for sharing! been going through this guide for the past few hours and making a couple of amendments to my site found it really useful! SEO is a minefield! Hey Nigel! Thanks for stopping by. With some of those tweaks, I’m sure you’re going to start doing better on organic search! Thanks a million for this post. 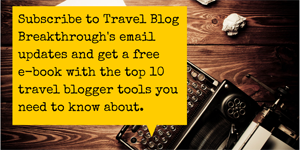 I’m new to the travel blogosphere. I’m basically an old dude with zero SEO knowledge. So this post along with your post on recommended plugins to use was extremely helpful. I’ve spent hours and hours trying to figure this stuff out and still feel pretty lost, but thanks to your your articles, at least I don’t feel like I’m walking around with my head in a burlap bag. I’m basically a guy who just likes to write…but at some point I knew I had to delve into this a bit more. I’ve been following your blog for awhile and it’s nice to see a fellow Canadian have some success. I’m from the other coast in Vancouver. Thanks again Will. Cheers! Hello from the East Coast to the West Coast! SOOOO glad I was able to help! I’m definitely no SEO pro but I just wanted to write something that broke things down in laymans terms. That’s a very good question. For me, I still think that online SEO is incredibly valuable in driving traffic. I can’t deny the 60-70% of traffic I get from Google. It’s just a no-brainer. Of course, offline SEO can’t be ignored because most of my blogging opportunities have come from offline SEO which have indirectly created more traffic. This has also resulted in most of the monetization that occurs on my blogs. I’m back on TBB again as I’m building up my strategy to increase pageviews. I’d love to see you do more posts on that and what worked for you personally with respect to pageviews. 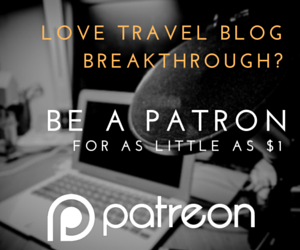 As always, thanks for building TBB into such a great resource for bloggers! Thanks for coming back Natasha! We just launched our travel blog and have not been ranking on Google. It has left me very frustrated along the way. This will help so much and I will be sure to follow all of these guidelines. It seems like post with numbers really help like “7 things to do here,” or “8 ways to eat healthy.” I agree with you that no one is really searching for your daily diary, besides your family 🙂 Hopefully we’ll be showing up on the first page of google soon. Great SEO information, helped me out with my site a lot. Thanks for the article! By the way thank you for the tips you share Will, I am glad I found this post.